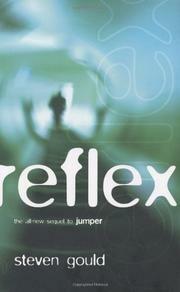 Belated sequel to Gould’s fine debut (Jumper, 1992) involving teleportation, spooks, and paranoia. Davy Rice is the only person in the world who can “jump,” meaning teleport himself instantly from place to place. Previously, he became involved with the NSA—doing only those jobs that didn’t conflict with his own ethical sense. But this time, when he jumps to Washington, DC, to meet Brian Cox of the NSA, bad hats drug him and murder poor Brian. Days later, Davy wakes—chained (he can't jump out of them) and implanted with a device that causes uncontrollable vomiting and convulsions if he attempts to jump away or misbehave. Meanwhile, Davy’s therapist wife, Millie, abandoned in their west Texas mountain hideaway, waits in vain for him to return. Eventually, she’s forced to attempt to climb down the cliff, falls—and finds that from sheer terror she’s jumped to their condo in Stillwater, Oklahoma! Swiftly Millie teaches herself to jump voluntarily, and contacts NSA agent Thomas P. Anders. The latter doesn’t know who snatched Davy, but suspects another agency—or even higher-ups in the NSA itself. As Davy’s forced to accept his captors’ conditioning, and work for them moving people and things around the globe, he begins to discover other dimensions to his talent. Millie teams up with Becca Martingale of the FBI (Anders has been sidelined) to uncover Davy’s trail. It leads to Martha’s Vineyard and a huge old house belonging to one Lawrence Simons, a shadowy figure who rubs shoulders with government bigwigs. Compelling, chilling, and completely satisfying, with lots of knowing jokes for the fans and plenty of scope for more sequels.